As a young man Adolf Hitler had taken a keen interest in the development of the motor car. One of his early heroes was Henry Ford, who had began production of the Model T in September, 1908. It was a great success and in 1913, the Highland Park Ford Plant became the first automobile production facility in the world to implement the assembly line. Initially it had taken 14 hours to assemble a Model T car. By improving his mass production methods, Ford reduced this to 1 hour 33 minutes. This lowered the overall cost of each car and enabled Ford to undercut the price of other cars on the market. Between 1908 and 1916 the selling price of the Model T fell from $1,000 to $360. It is estimated that by this time 50% of all cars in the world had been made by Fords. While in prison in 1924 Hitler also read an article entitled the Motorization of Germany. It was during this time that Hitler developed the idea that he wanted to be responsible for Germany's Model T. According to Richard Evans, the author of The Third Reich in Power (2005), "by the early 1930s he was drawing rough sketches of a small family vehicle that would sell for less than a thousand Reichsmarks and so be within reach of the vast majority of the population". Hitler also wanted to fill these highways with German built motor cars. At that time, there was only one motor-car for every fifty persons (compared to one for every five in America). German people had to use a bicycle or public transportation to get about. Hitler approached leading figures in private industry and demanded they produced an automobile for around $396 (this was the kind of price being paid for cheap cars in America). They said it was impossible and so Hitler decided that they had to be produced by the state. 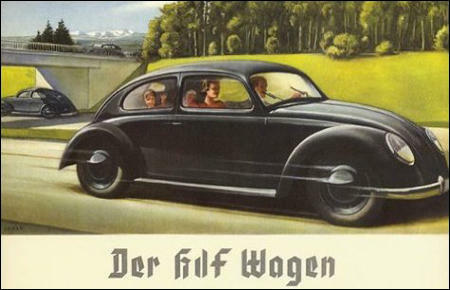 In 1935 Adolf Hitler announced that the government had plans to produce a "People's Car" (Volkswagen). 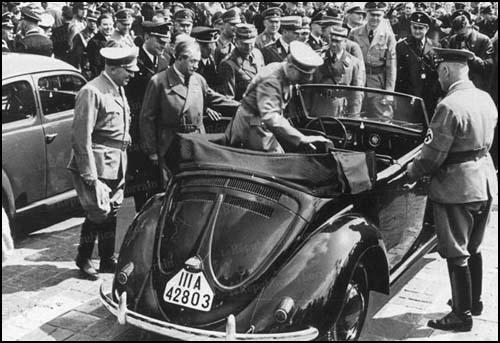 Hitler gave his drawings of his "beetle car" to Ferdinand Porsche, a man who had become famous for designing racing cars. However, Porsche's prototype design was not ready until the end of 1937. 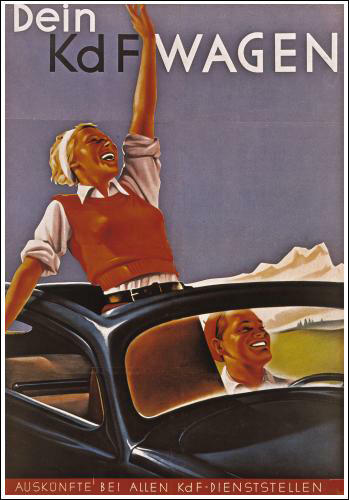 As of August 1st (1938), the great savings programme for the People's Car "Strength-Through-Joy" will begin. I herewith proclaim the conditions under which every working person, can acquire an automobile. (i) Each German, without distinction of class, profession, or property can become the purchaser of a Volkswagen. (ii) The minimum weekly payment, insurance included, will be 5 marks. Regular payment of this amount will guarantee, after a period which is yet to be determined, the acquisition of a Volkswagen. The precise period will be determined upon the beginning of production. (iii) Application for the Volkswagen savings programme can be made at any office of the German Labour Front and of Strength Through Joy, where further details can also be obtained. Factories and shops can submit collective orders. A Volkswagen for every German - let that be our aim. That is what we want to achieve. Will all of you help in that; it shall be our way of saying 'thank you' to the Führer. For a large number of Germans, the announcement of the People's Car is a great and happy surprise. A real Strength-Through-Joy car-psychosis developed. For a long time the car was a main topic of conversation in all sections of the population in Germany. All other pressing problems, whether of domestic or foreign policy, were pushed into the background for a while. The grey German everyday sank beneath notice under the impression of this music of the future. Wherever the test models of the new Strength-Through-Joy construction are seen in Germany, crowds gather around them. The politician who promises a car for everyone is the man of the masses if the masses believe his promises. And as far as the Strength-Through-Joy car is concerned, the German people do believe in Hitler's promises. Nobody was unemployed anymore. People who had gone hungry found work.... The masses saw they were better off economically, and that was the main thing... the dispatching of people to the countryside (to help with the harvest), the Strength through Joy program, the vacation trips. The little guy was able to the Strength through Joy program, the vacation trips. The little guy was able to get something for himself, later on even the Volkswagen. 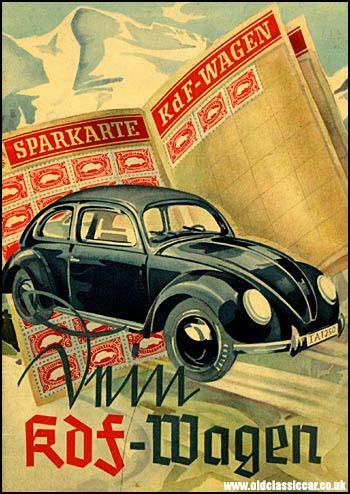 The People's Car (Volkswagen) project launched in 1938... The first show models - no others were ever built during the Third Reich - were exhibited at Munich and the Vienna autumn fair at the height of the Sudeten crisis. The scheme, which, in contrast to universal hire-purchase practice, provided for delivery only after payment of the last installment, had attracted three hundred thousand purchasers by November 1940. Dr Ley's ingenious plan was that the workers themselves should furnish the capital by means of what became known as a 'pay-before-you-get-it' installment plan - five marks a week, or if a worker thought he could afford it, ten or fifteen marks a week. When 750 marks had been paid in, the buyer received an order number entitling him to a car as it could be turned out. The scheme by which workers, under the influence of a massive advertising campaign, parted with a portion of their wages each week to put towards buying a "Strength Through Joy car" turned out to be no more than a means of getting them to put in more overtime so that they could contribute to the financing of rearmament. By the end of 1939, 270,000 people had lent 110 million Reichsmarks to the state in this way. In the end, no fewer than 340,000 people invested their money in the scheme. Not one of them ever got a Volkswagen in return. The factory was converted to war production in September 1939. Three years ago Hitler ordered his leading motor engineers to design a small cheap car suitable for the use of members of the Labour Front. The main part in the production of an exceptionally exacting design has been played by Herr Porsche, who has been responsible for some of the finest racing cars built in Germany. An enormous factory is being erected at utmost speed by thousands of workmen, and manufacture will begin this year, though even in the absence of further political crises it remains uncertain whether any large numbers of cars will be delivered within twelve months. 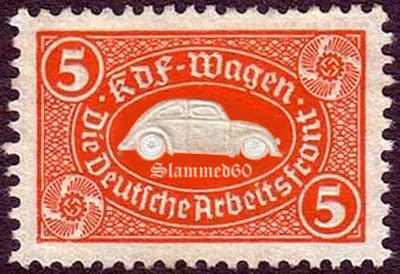 Considering that real wages are still low in Germany, a scheme for furnishing all members of the Labour Front with private motor-cars is definitely audacious, but if German press reports are trustworthy the plan is at least feasible, for it is stated that upwards of 200,000 cars have already been ordered. The finances of the totalitarian States continue to perplex economists, and no British authority has succeeded in solving the £ s. d. of this ambitious enterprise. It is, of course, obvious that if a dictator who periodically or continuously demands great sacrifices from his subjects desires to keep them contented he could hit no on more promising palliative than to provide a motor-car for every family, even if the scheme would exert a boomerang effect in time of war, when all fuel would be absorbed by the Air Force and a mechanised army. In order to allay discontent, Hitler conceived of a new idea. Every German shall own his car. He asked industry to devise a popular car model to be built at such a low price that millions could buy it. The Volkswagen (People's Car) has been talked of for the past five years and has never been seen on the market. "These cars will be built for the new highways," said the party propagandists; "an entire family will be able to ride in one of them at 100 kilometers (60 miles) an hour." The party leaders say that the highways were built for the People's Car. But the People's Car is one of the most bizarre ideas the Nazis ever had. Germany is not the United states. Wages are low. Gasoline is expensive. German workers never dreamed of buying a car. They cannot afford the upkeep; to them it is a luxury. Dr. Ley, the stammering drunkard who is the chief of the German Labor Front. He controls the four to five hundred million marks paid in every year by the German workers as dues to the Labor Front. I do not say that he puts all this money into his own pocket. But the figure has certainly turned his head. He had an automobile factory built for the production of the People's Car. On this occasion he invented a brand new form of knavery. The future buyers of the People's Car were invited to buy it in advance, by making pre-delivery installments. This is the reverse of the credit installment system. The system shows genius. Ley pocketed about a hundred million marks when the war came because the People's Car factory now had to produce tanks and motorcycles for the army. It was the Yorkshire-born Ivan Hirst who, between 1945-49, saved the Volkswagen car business and, as much as anybody else, laid the foundations for the successful postwar German motor industry. Hirst arrived in Germany when the British army took over control of the Volkswagen factory at Wolfsburg from the Americans in the summer of 1945. As a major in the Royal Electrical and Mechanical Engineers (Reme), his brief was to run a workshop for British army vehicles in the partly-ruined plant. The original intention was to dismantle the entire production line and ship out the machinery and tooling as reparations. Hirst's superior, Colonel Charles Radclyffe, who was in charge of car manufacture in the British zone, was responsible for carrying out this plan. However, when the Volkswagen equipment was offered to Britain's motor manufacturers, including Rootes and Morris, they turned it down. An official British report famously found that "the vehicle does not meet the fundamental technical requirement of a motor-car... it is quite unattractive to the average buyer... To build the car commercially would be a completely uneconomic enterprise." The British army thought differently and, after one of the few surviving wartime Volkswagen cars had been demonstrated to the British Rhine army group headquarters, the military ordered a batch of 20,000 similar vehicles. By the end of 1945, the factory had somehow managed to put together 2,490 cars. Many of them were then bartered for materials to make further cars, or for provisions to feed the 6,000 workers and other citizens of Wolfsburg, the company town built before the war as Volkswagen's headquarters. Ivan Hirst was the man who got production going. He organised the clearance of bomb damage and had the buildings repaired; he re-commissioned machine tools, body presses and assembly jigs; he concerned himself with improving the quality of the car, with setting up a sales and service network and with starting exports - the first went to Holland in 1947. 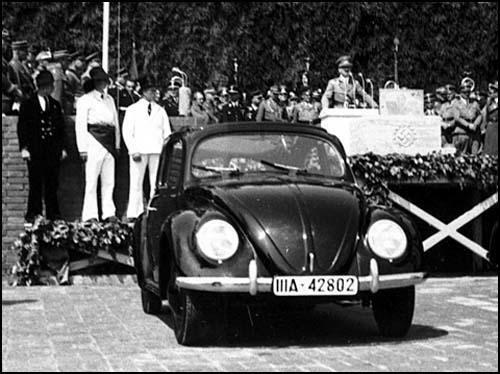 He became a great enthusiast for the Volkswagen, which he was always ready to defend, even against the interference of the British authorities. His view was that the factory belonged to the German people, and it was his task to see that they got it. In 1947, Colonel Radclyffe decided that a suitable German must be found to take over the company. Following a tip-off from an army colleague, Hirst found the former Opel production manager, Heinrich Nordhoff, running a small workshop in Hamburg, and was instrumental in getting him appointed as managing director in January 1949. Nordfhoff served with Volkswagen for 20 years until his death in 1968, building up the plant into one of the world's leading car manufacturers. Hirst finally left Wolfsburg in August 1949 and, the following month, Radclyffe, on behalf of the Allied Control Commission for Germany, handed over the Volkswagen company to a trust run by the new West German federal government and the state of Lower Saxony. A week after it bought Rolls-Royce, and just as it adds Lamborghini sports cars to its automotive stable, Volkswagen is facing a lawsuit seeking payment of wages to Jewish slave laborers forced to work for the company during World War II. Klaus von Munchhausen, a lecturer at Bremen University, said today that he was suing Volkswagen on behalf of 30 Hungarian-born Jews, all living in Israel, who were chosen for slave labor - rather than the gas chamber - at Auschwitz. The legal action was a blunt reminder of Volkswagen's roots not only as Hitler's favored car company -- the idea of a Volkswagen, or, ''people's car,'' was a prewar pet project - but also as a key player in the Nazi armaments industry, building war materiel ranging from jeeps to rockets. The plaintiffs worked at Volkswagen plants in Lower Saxony between 1944 and 1945, and, based on what a German worker would have earned at the time, Mr. von Munchhausen said they were owed around $28,000 each. Two years ago Volkswagen published a history of its wartime operations in which it acknowledged using slave labor. But the company has refused to pay out individual claims for wages, saying it is impossible to quantify the appropriate amounts. Volkswagen officials dealing with the issue did not return a reporter's calls today to verify reports that the company was prepared to make some kind of payments to the European countries from which many slave laborers came. Question 1: Read sources 2, 6, 8 and 9. Explain the main difference between the way that people in America purchased the Model T to the German people buying the Volkswagen in the 1930s. Question 2: Select two sources that provide information that suggested that the German people were happy about the production of the People's Car (Volkswagen). 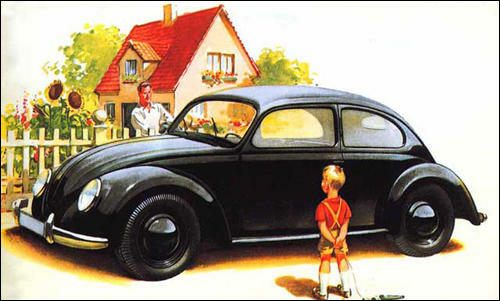 Question 3: Use the visual sources to explain how the Nazi government encouraged the German people to buy the Volkswagen car. Question 4: Select information from the sources that show that the German people were unhappy with the Volkswagen project by 1939. Question 5. Why is it that the British Army began producing Volkswagen cars between 1945-1947? Question 6: Why did 30 Hungarian-born Jews take legal action against Volkswagen in 1998?